Portal fans have been patiently waiting for a sequel to their favorite puzzle adventure game for years, and it finally debuted this week on all major platforms, including the Mac. 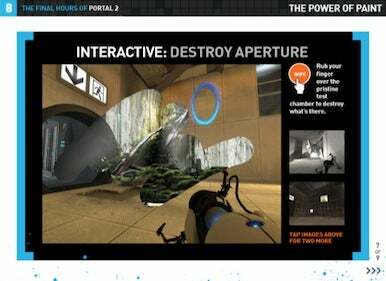 Now, thanks to game journalist Geoff Keighley, they can learn why they’ve been waiting so long and why it’s all been worth it by delving into The Final Hours of Portal 2 for the iPad. Keighley details the long and storied development of the popular Valve sequel with a behind-the-scenes look at the eagerly anticipated game. He captures the development process from start to finish and even gets an exclusive view of the secret prequel that Valve shelved in the eleventh hour. The app lays out the story behind the sequel and its fabled predecessor with exclusive photos and videos of the early stages of the game and interviews and interactive videos with the game’s chief developers. Keighley also promises a few other surprises. The app is available only on the iPad for $2.